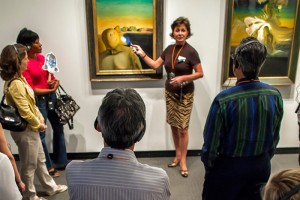 The Docent Program at The Dali Museum is at the heart of the Museum’s educational mission. Adult docents enroll in a 21-week training program (roughly the equivalent of a 3 credit university-level course) that consists of weekly three-hour lectures, three written tests, and a final mini-tour examination. There is a $150 dollar fee for the program plus a $100 deposit. After completion of initial training, docents are required to conduct six tours to receive a return of deposit. In addition to the initial training period, there is ongoing training for docents including curatorial walk-throughs of new exhibitions, refresher classes and advanced seminars. 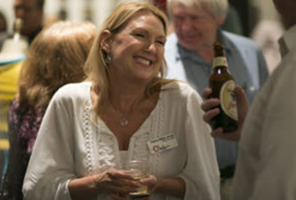 Docents are responsible for developing their own tours and are encouraged to develop a repertoire of tours for specific audiences and special interest groups. Adult Docents: Create and conduct public tours of the Museum’s permanent and visiting exhibitions as well as private tours arranged by the Group Tours department. Over 100 docents currently lead tours at the Museum. Teen Docents: Check back soon for more information. Junior Docents: As part of the Junior Docent Art Camp, elementary and middle school students are trained in a mini-docent course that enables them to share general information about Dali and his paintings. This program introduces students to artistic processes, builds self-esteem and public speaking skills, and brings families to the Museum. 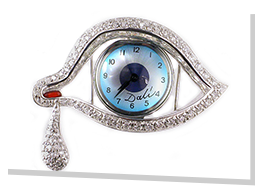 The Dali encourages people of all ages, ethnicities, and cultures to apply. The Dali welcomes visitors from more than 30 nations; those who speak additional languages (other than English) are especially encouraged to get involved. The next Docent training program begins January 2019. Interviews will begin late fall 2018.